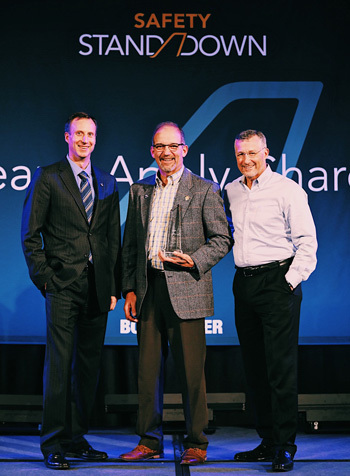 Bombardier announced today that Martin G. Grier, Senior Manager, Aircraft Maintenance for The Home Depot Aviation Department, has been recognized for his exceptional commitment to aviation safety at the 22nd annual Safety Standdown seminar, held from October 30 – November 1, 2018, in Wichita, Kansas. Mr. Grier is the first-ever maintenance professional to be recognized with the award. Since 2012, the Safety Standdown award was presented to pilots, safety board members, directors of safety, and safety advisors. "Marty truly embodies aviation professionalism," said Jeff Wofford, Chief Pilot & Director of Aviation from CommScope. "His depth of experience in aircraft maintenance, modifications, specification and completions is directly tied to how he leads, nurtures and grows a strong safety culture. He sets an exceptional example for others to follow." This year's Safety Standdown seminar was an overwhelming success with more than 500 aviation professionals attending the workshops and general sessions. The increasing number of attendees demonstrates the expanded focus within the industry to engage and develop aviation professionals to continuously seek safety knowledge, integrate new information into everyday operations, and share new findings and best practices with their industry peers. "For over two decades, the Safety Standdown seminar has attracted a growing number of aviation professionals, eager to acquire the most up-to-date tools and information to reduce aviation safety risks," said Andy Nureddin, Vice President, Customer Support, Bombardier Business Aircraft. "Year after year, Bombardier is proud to support aviation safety and professionalism through knowledge-based pilot safety training and the promotion of high standards and best practices for the industry." Next year's Safety Standdown seminar will be held from October 30 to November 1, 2019, in Dallas, Texas.